One thing I really love about fall is that there are little pumpkins for sale at the grocery store and at farms all over the place. While the big, huge pumpkins are good for making Jack-0-lanterns, they are not that good for eating in my opinion. The little sugar pumpkins, however, are really good. 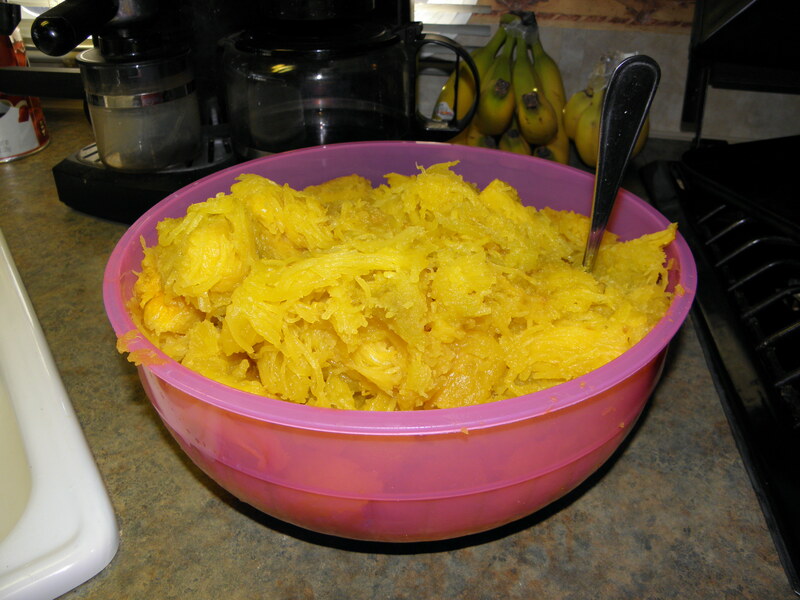 And ever since I bought my first one in Pennsylvania and cooked it, I will never go back to canned pumpkin. There is no comparison. 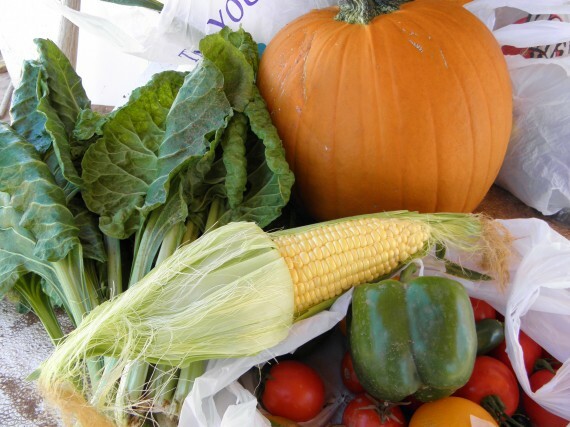 Yesterday we went down to Kanab, and went to the produce garden there on Hwy 89. He had lots of good stuff ripe and ready for harvest. I was so excited to see that his pumpkins were ready to pick. 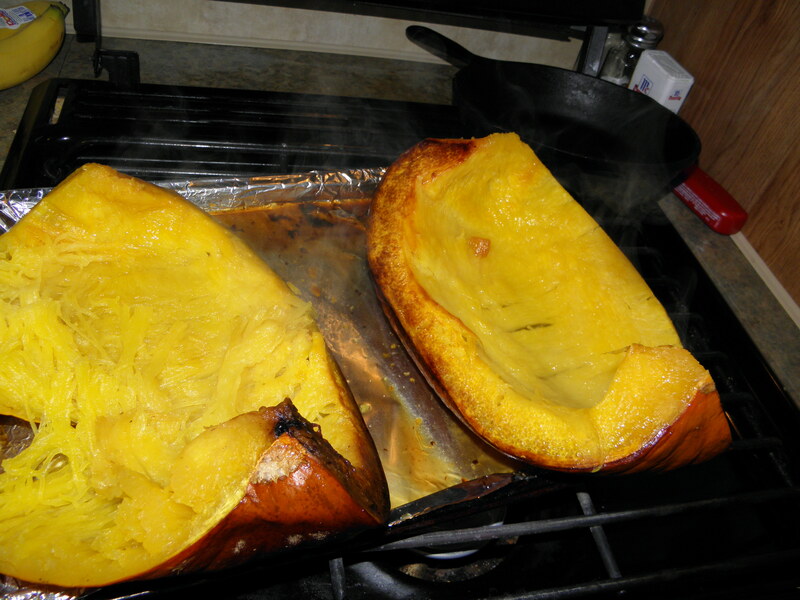 I spent today cooking the pumpkin. To cook it, first you have to get it ready. I took it outside on the picnic table, and cut it in half, then cut each half in half. Cut the pumpkin in four pieces. 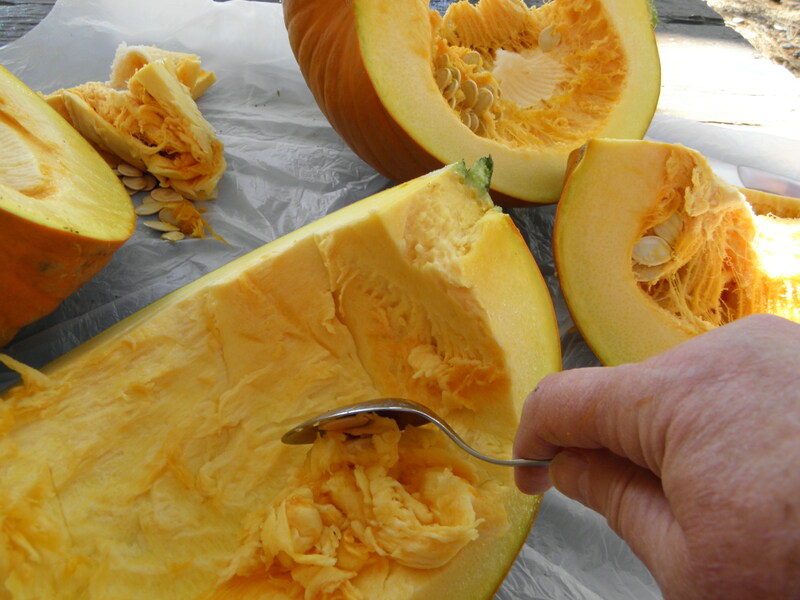 Using a knife, cut the stringy part with the seeds in it out of the middle of each piece of pumpkin. Use a spoon to scrape the rest of the stringy part out. Then, use a spoon to scrape out the rest of the stringy part. 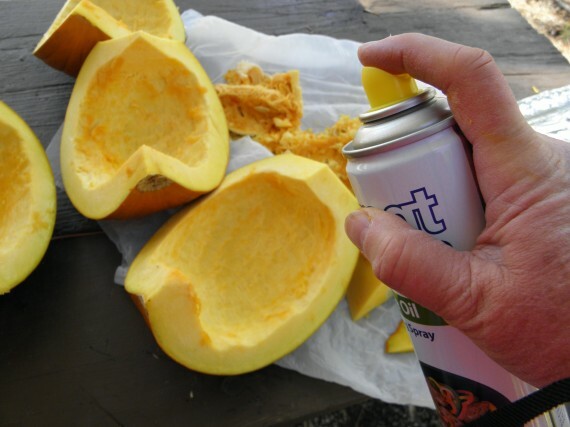 After all the “guts” have been scraped out, spray each piece of pumpkin with olive oil. Place the pieces cut side down on a foil lined baking sheet. Put an oven proof bowl with water in it underneath. Cover the whole the pumpkin and pan with aluminum foil. Place in the oven and bake at 400 degrees for one hour. I have a VERY small oven, so I checked to see if these pieces would fit before covering with foil. (I live in an RV, so my oven is very small. I checked to see it the pumpkin pieces would fit before covering with foil. When the pumpkin is done, take it out of the oven, remove the foil and the bowl of water, and let it cool until you can touch it without burning your fingers. 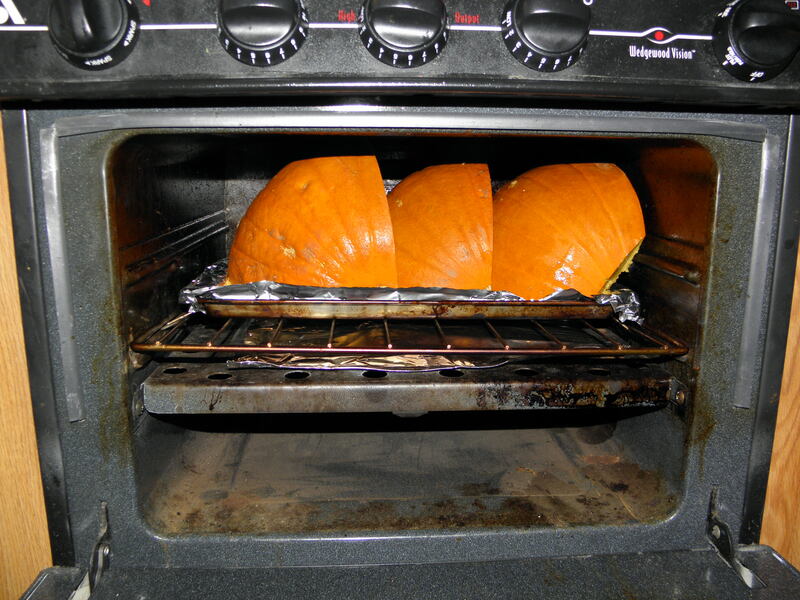 Let the cooked pumpkin cool off. 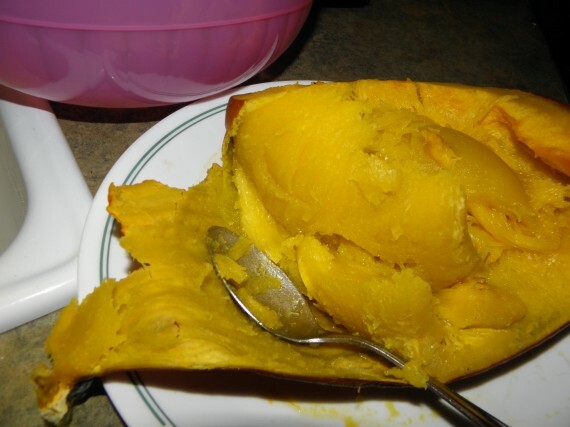 When the pumpkin is cooled off, use a spoon to scrape the pulp off of the pumpkin rind. It will be very easy to remove the rind. It is easy to remove the peel after the pumpkin is cooked. This is good enough to eat just like this! 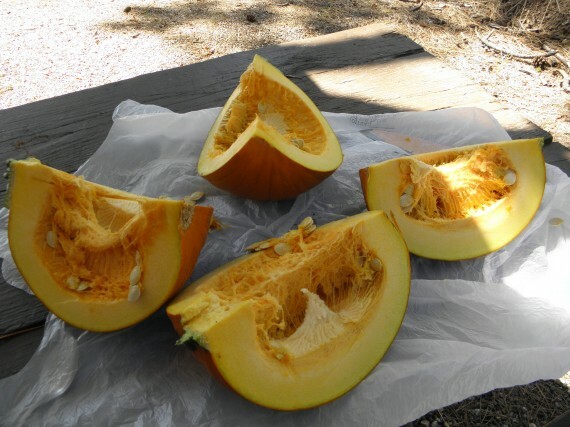 Tomorrow, we’ll make a pie and some muffins using the fresh cooked pumpkin! Pumpkin seeds are a favorite of mine, but I’m afraid even twelve cups of pumpkin is too much for me! I made a pumpkin pie with a sweet pumpkin last year and I will never go back to canned, it made such a difference. Since I don’t have an oven in the RV, I prep pumpkins the same way. However, I put the pieces on a paper or microwave-safe plate, cover them with waxed paper, and cook them that way. And it doesn’t heat up the rig, either. 2 years ago Jim and i worked at a pumpkin farm telling stories. We had pumpkin almost everyday and got to try 18 different varieties. Try stuffing the quarters with your favorite country sausage mixture and baking or microwaving that. Yum! I do the same as Chris and mine is all cooked in the microwave. Just took fresh pumpkin out of the oven and thought of your post!